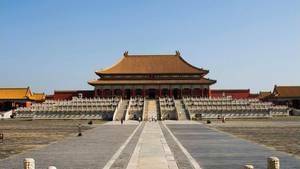 Only two Chinese dynasties lived in the Forbidden City, Ming and Qinq. The emperors belonging to this dynasty were the last, Pu Yi lived the creation of the Republic of China. Here is some information about this dynasty. The last imperial house ruled over China, the Qing came from a group of Tungus tribes living in the forests of eastern Manchuria, considered vassal by the Ming, and federated in the late sixteenth century by Nurhaci ( 1559-1626), held for the founder of the dynasty. The construction of a Manchu State (the word appears in 1636), strongly inspired by the Chinese example but having its own tribal and military institutions (the system of "Eight Banners"), is his work and that of his son Abahai ( 1592-1643). On the eve of invading China, the Manchu had time to seize the Ming territories of Liaodong (hostilities began in 1618), to launch several deadly raids in China own, establish their suzerainty over Korea and Eastern Mongolia and to absorb very many Chinese in their army and their administration. In 1644, while facing General Wu Sangui's army at the Shanhaiguan Pass, they got along with Shanhaiguan to fight the rebel Li Zicheng who had just taken Beijing. Once in the city, the Manchu people establish their regime. The Emperor Shunzhi (reign from 1644 to 1661) is still a child, the true architect of the conquest of the empire will be the regent, his Uncle Dorgon. This conquest is both fast and slow. The Sino-Manchu armies seized Nanjing, where the Ming retreated in 1645, and the other provincial capitals of southern China fall soon after. But while welcoming the notables to these new protectors of the order is generally favorable, loyalist resistance has nonetheless remained endemic for many years, especially in the Yangtze Valley and along the southern coast. East. The last of the Ming princes, a refugee in Yunnan, was captured and executed in 1662 on the Burmese border, but the pirate Koxinga continued the resistance in Taiwan. In 1673-1681 the young emperor Kangxi (reign from 1661 to 1722) faced a vast rebellion in South China, led by three of the Chinese generals (including Wu Sangui) who have helped the Manchu to conquer the empire, but now refuse to be stripped of the quasi-autonomy they enjoy in their fiefs. The marches of the empire are conquered or reduced to the state of protectorate in the following decades: taking of Taiwan (1683), protectorate on present-day Mongolia-Outer (1690-1691), on Tibet (1720), on Central Asia (or Xinjiang) after multiple expeditions against Western Mongols (1696-1759). The territory thus constituted is the largest ever controlled by a Chinese dynasty and corresponds roughly to that of the current People's Republic of China. Internally, the Manchu people are working to rebuild the state and the economy on bases essentially borrowed from the Ming. Seeking to conciliate the Chinese elites by associating them with the government, they pose themselves as continuators of tradition and protectors of arts and letters. After the initial upheaval, the first half of the dynasty, essentially the long reigns of Kangxi and Qianlong (1735-1795), is an era of peace and prosperity as China has rarely known. It is particularly marked by a very strong economic and demographic growth (from 1800 the population far exceeds 300 million). The administration is generally efficient, especially after the reforms of Emperor Yongzheng (reign from 1722 to 1735), which centralize the government and rationalize taxation. The Manchu Empire in the eighteenth century is certainly the most powerful in the world; it is also the most admired in the Europe of the Enlightenment, which perceives it through the prism of descriptions of Catholic missionaries, admitted to the court since the end of the Ming. However, many imbalances appeared before 1800. Population growth has pushed the exploitation of arable land to the limits of their possibilities, and the wild clearing of the mountain massifs has harmful ecological consequences, perceived since that time. The end of Qianlong's reign is marked by the court's expensive lifestyle and the growing corruption of a bureaucracy completely dominated by the favorite of the old emperor, a young Manchu guard named Heshen. The rebellion of the White Lotus, which ravages the massifs on the border of Hubei, Sichuan and Shaanxi between 1796 and 1804, is one of the consequences of these developments; it also highlights the military weakening of the dynasty. The sanitation efforts of Emperor Jiaqing (reign from 1796 to 1820) can not reverse the trend. If China remains a formidable empire, its international position weakens. Since the end of the eighteenth century, Western powers have been eager to break the constraints on foreign trade under the Canton system. The cash profits that it brought back to China give way to a growing deficit due to opium imports. The severe banning measures imposed by Emperor Daoguang (reign 1820-1850) and his adviser Lin Zexu led to clashes with English and French expeditionary forces known as the "Opium War" (1839-1842). ). Even if it does not have much immediate impact, the Nanking treaty that concludes them - the first of the "unequal treaties" - opens a process of opening of China to foreign nations that will last until the end of the century and provoke many other conflicts. The revolutionary movement of the Taiping, which swept over a large part of the empire between 1850 and 1864, is partly the consequence of these developments, if only by the Christian inspiration found by its founder in Hong Kong, or by the success that he encounters with the active circles in the smuggling of opium from Guangdong, unemployed by the opening of Shanghai. In conjunction with other rebellions such as the Nian in North China, the Taiping are not far from overthrowing the dynasty, which owes its survival to both organized resistance in the provinces by a number of senior loyalist officials, and the support finally granted to it by the Western powers. The conservative political revival of the Tongzhi (1862-1874) and Guangxu (1875-1908) eras, during which the supreme power is held by Empress Dowager Cixi, as well as the more or less successful attempts to create a heavy industry under the aegis of reformist senior officials (the "Western Affairs Movement", yangwu yundong), can not remedy the military weakness of the empire. This is highlighted during the defeat against Japan in 1895, felt like a national disaster. The oppositional dynamic created by the popularization in China of Western notions of democracy and revolution, the powerful anti-Manchu sentiment maintained by secret societies, the weakness of the regime against foreigners, and its reluctance to grant constitutional reform, lead to the 1911 revolution and the fall of the Qing.